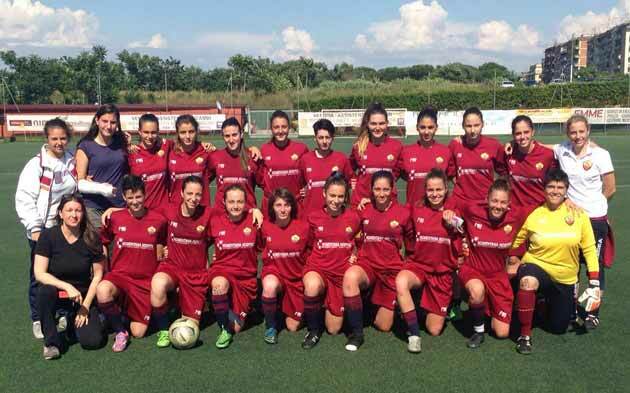 Another title for Napoli Calcio Women's Carpisa Yamamay, who won the Campania Under 17 Cup yesterday, is holding all the Campani youth championships as she prepares, after winning 2 for 1 the first leg of the Primavera semifinal, to play all all the final championship title in the category. without counting the many tournaments that have seen the "tartarughine" always win starting from the Christmas tournament to the last two of Giuliano and Casalnuovo. The final with Virtus was decided only on penalties but the biancazzurre have touched the advantage numerous times especially with Azzurra Massa who three times had the chance to unlock the result. NAPLES CFM : Parnolfi, Criscuolo, Esposito F., Musella, Iorio, Esposito P., Lombardi, Marotta C., Massa, De Biase, Vecchione. 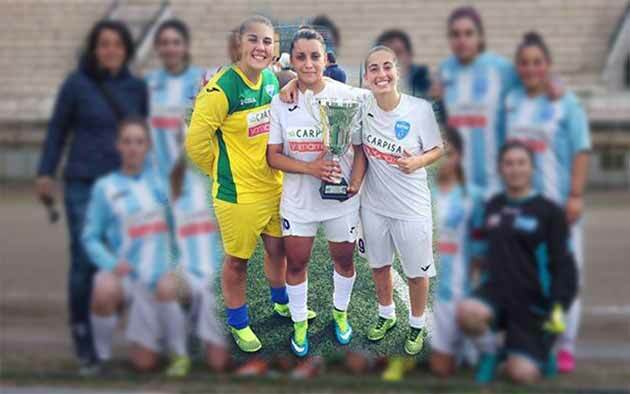 Last appointment for the girls of Roma Calcio Femminile with the Lazio Cup. Another good victory for the Giallorossi who are ideally in the final. The final will be played by Vis Nova Roma and Latina by virtue of the fact that the Giallorossi played the competition off the charts. They still have the moral satisfaction of having won the final and many compliments. Right from the start the young Giallorossi players poured into the opposing half of the field collecting goal chances: at 1 'Visentin in slalom skips its markers enters the area and pulls out of a breath; at 4 'Tumbarello, on the development of a corner kick, missed an easy opportunity, at the 5' still Visentin severely committed the goalkeeper with a great shot from the edge, the 14 'Visentin receives a ball from Giuliani enters the area from the left and from a tight angle the goalkeeper beats. 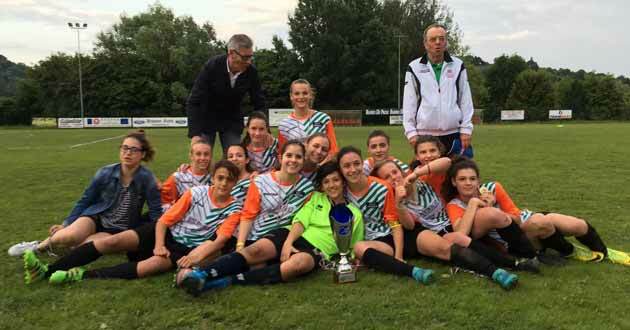 After winning the autumn and spring stages of the Women's Under 15 Championship of Veneto, the Veneto Committee is giving away the participation in the Grass Roots Festival in Coverciano that will take place the 12 June, the final between Real Venezia (always before in stages), and Verona agsm (always second). The match was played in a neutral match in Vicenza, where Real Venezia (7 to 6) prevailed on penalties after the match had ended in the regular 1 1 times. For Real Venezia (first with the name ZelarinoVenezia) is the fifth participation in about 10 years, the result of good work in the youth sector. In the final of the Young 15 Youth Spring Championships, which took place this Thursday 18 May on the Vicenza neutral, the baby Gialloblù dell'Agsm Verona were defeated on penalties by the "black beast" Real Venezia after the regular timing had concluded in a tie on one by one. The Agsm Verona takes the field with Fenzi, Dal Barco, Santinato, Gobbi, Zanoni, Fusini, Rama, Mancuso, Prando. Available Sargenti, Boni and Bonomini. Sergio Meneghini coach. The first to be dangerous are the Venetian with Ruggero on free kick but Linda Fenzi is ready and rejects the ball. IMG-20160518-WA0001 On the opposite side, the scaligere also took advantage of a kick placed by Jessica Zanoni and rejected by the Venetian one, Berna.